What is Dermapen and Dermal Roller treatment? The Dermapen treatment uses multiple needles to vertically pierce the skin to create numerous micro wounds stimulating the body’s natural healing process, similar to the effect of a fractional laser treatment. Why does Skinnotion offer Dermapen treatments? Prior to the Dermapen skin needling procedure, a numbing cream or cooler may be applied at the treatment area to reduce any discomfort. The sterilised one-time use pen will then be placed over the treatment area to vertically penetrate the skin. Skinnotion uses Dermapen as, it is one of the safest and most effective non-surgical treatments for skin restoration featuring a minimum price tag that requires minimal downtime. The number of recommended treatments depends upon the type of treatment needed. Stretch Marks: At least 10 treatments at intervals of six weeks. The duration of the session depends upon the number of areas being treated. It generally takes about 30 to 60 minutes for each session. You will see a marked improvement after the first treatment itself. Significant improvement will be visible after four to six treatments. The best results will be visible about six to eight weeks after the treatment when the collagen starts to rebuild. The results will be more visible over a period of about a year. The cost of Dermapen depends upon the area and number of areas being treated. Want to know more about Dermapen Treatment in Sydney? A doctor will assess your skin prior to the first Dermapen skin needling treatment. You may need to prepare your skin with an active ingredients cream for about two weeks prior to your Dermapen treatment to achieve the best results. After your Dermapen skin needling treatment, you must avoid using lotions and moisturisers that contain perfumes, colours, glycolic acids and retinol. Instead, it is recommended that you apply the provided moisturiser for a period of three to seven days. Avoid exposure to the sun for 2 weeks after a Dermapen treatment as the skin is extra sensitive. It is highly recommended to regularly use sunscreens. In case the skin develops a crust or a scab, you must not pick it as that may lead to scarring. You should avoid smoking as it inhibits collagen production. For best results the skin needs to be prepared with active ingredients such as Vitamin A, Vitamin C, and Procyanidin for about two weeks before a Dermapen treatment. This allows the skin strength to build especially in delicate skin areas, speeds up the healing time, and reduces the chances of post peel complications. Please discuss with your consultant. 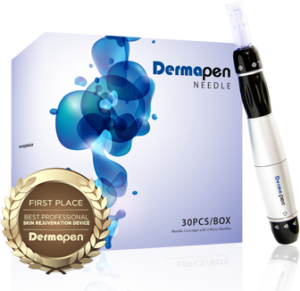 Dermapen skin needling is a safe procedure with very low risks. Infection and scarring are rare. You may develop regular Dermapen side effects such as mild swelling, bruising, and redness which would heal in two to three days. Scabs and crust might develop with more aggressive treatments and should resolved in one to two weeks. Rarely post-inflammatory hypo or hyperpigmentation occur. Hospitalisation is not required for Dermapen skin needling treatment. There is no age limit for undergoing Dermapen skin needling treatment. Any healthy person above the age of 18 can undergo the procedure. There are no major complications except for regular Dermapen side effects such as swelling, bruising, and redness. Chances of skin irregularities after Dermapen skin needling are very low. Bruising and swelling are the most common as part of the procedure. They generally get resolved in a few days. No bandages are applied after a Dermapen treatment. You do not need to take time off work after your Dermapen skin needling treatment. You can return to work immediately after your treatment. However, with more aggressive treatment you may required to stay home for a day or two. You should avoid exercising for about 24 hours after your Dermapen treatment as sweat can cause a stinging sensation. You should avoid direct exposure to the sun for about one or two weeks after your Dermapen treatment. It is recommended that you regularly use sunscreens. There is no need to follow a special diet after your Dermapen skin needling. No, the result is long lasting but is not permanent as the skin is continue to age, you would need periodic Dermapen treatments to maintain the effects. Scarring is rare after a Dermapen treatment. Yes, you can drive home after your treatment unless you were given sedative during the procedure. Will I have to return for post operative care? Yes, you will have to return for a Dermapen review in one week in order for the doctor to monitor your progress.